Early Booking Offer – Up to 50% Off!!! Tinos View – Luxury Apartment resort in Tinos Island, Cyclades, Greece. 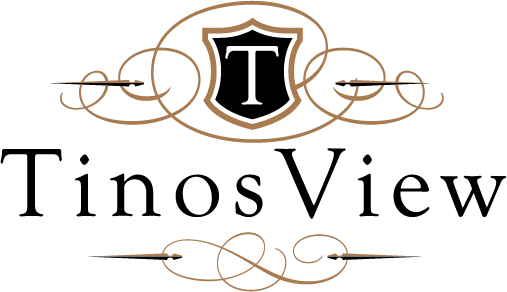 Welcome to the official website of the Tinos View-Tiniako Panorama Luxury Apartment resort in Tinos Island, Cyclades, Greece. Tinos View-Tiniako Panorama is a brand new Luxury Apartment complex situated on the south-eastern cape of Tinos island, Greece, overlooking the Aegean Sea and its beautiful Cycladic islands Syros, Mykonos, Delos and others, as well as the mainland of Tinos Island. Enjoy your vacation on the Greek islands and relax at the state-of-the-art, fully furnished apartments with amenities of a 5 star resort and its unique architectural style that appeals to the sophisticated traveler seeking to enjoy restful vacation in Greece and the beauty of the Cycladic islands. Inside each apartment there is a fully furnished lounge/sitting area, kitchen with appliances, cable TV, A/C, free Wi-Fi and DVD on demand. Situated on a hill 65m above sea-level, guests are within a short walking distance of the beautiful beach of Aghios Phokas-Vryokastro and a 10-minute drive from scenic Tinos Island villages. Just 3 km away, the Town of Tinos Island offers plenty of restaurants, bars and shopping. 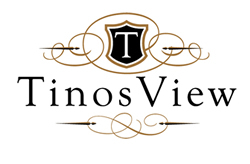 Tinos View – Tiniako Panorama offers free private parking on site. Vacation on the Greek islands will never be the same after your stay at Tinos View – Tiniako Panorama. 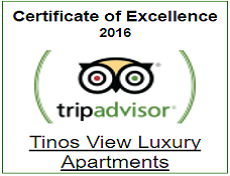 Tinos Apartments offered us the perfect place to stay & discover the island: a spacious 2-bedroom apartment with a fantastic view & all the necessary facilities. The place is kept spotlessly clean & the hosts are kind & welcoming & helpful. The beach is a short walk away. For everything else you’d need a car. The free wi-fi is good but very weak as a signal. Anyway, we loved our stay & greatly recommend the place. Thank you! Tinos View Tiniako Panorama is a brand new Luxury Apartment complex situated on the south-eastern cape of Tinos island, Greece, overlooking the Aegean Sea and its beautiful Cycladic islands Syros, Mykonos, Delos and others, as well as the mainland of Tinos Island.